I decided to investigate this variety hoping that it would flower early in So. Florida and would be a good pollinator for some of my A type trees. There is some conflicting information in the net about size of this fruit. This is what the University of California says: Originated 1938 in Santa Monica, California. Tree is a vigorous grower with an upright and round shape. Season: June to September. Skin is tough & leathery and peals easily. Eating qualities are excellent. Fruit at South Coast Research and Extension Center are consistently larger than listed above running in the 15-28 oz range. Fruit tend to be hidden inside the foliage. 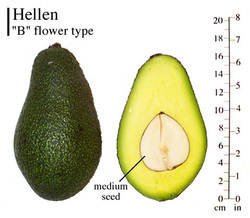 Seem to be a a difference as to fruit size at different locations. A tree has been top worked in December 2013. March 12, 2014: The tree grafted in December 2013 is doing well. all grafts growing. Should be a nice tree in 12 months. February 21, 2015: The tree is doing well. It is just starting to flower.It has a few open flowers. Confirmed B type.not early enough for what I was looking for. Hope it can set fruit on its first year. February 26, 2015: The flowers that opened a few days ago are setting fruit. Interesting tree. May be less than 5% of it potential flowers have opened. Is growing above average. Good size for 14 month old tree.